The Walking Dead Review: "Scars"
Alright, they did it. The Walking Dead finally went and did it. They provided a majority of the answers I’ve been begging and pleading for throughout season 9—the basic information that has been necessary this entire time to understand what changed Michonne so drastically during the six-year time jump. I can happily report that after five weeks of assessing a standardized, one-point deduction to every Walking Dead review score, I can finally go back to using an unweighted final total. It’s been such a long time, it almost seems novel once again. And thank god, because if AMC had persevered with the audacity to not explain things like Michonne and Daryl’s “X” scars in an episode that is literally titled “Scars,” I would have had no choice but to lay down and let my body be reclaimed by the loam. “Scars” falls back on a style of episode construction that has become common throughout season 9, threading past and future events together in parallel. Both stories revolve essentially around Michonne, and both concern the disappearance of Judith. In the present day, Judith has run off in an attempt to offer assistance to Daryl, Connie, Henry and Lydia—who, truth be told, don’t really seem to need it. And in the past … well, the past is much more interesting, in “Scars.” The reality of this episode is that every time the action shifts back to the present, we’re annoyed, because after waiting so long, we just want the flashback sequences to get on with it, in Python-esque fashion. I must admit, it was certainly a curve ball to have someone Michonne knew from her former, pre-apocalypse life to come strolling up to the gates of Alexandria—someone who knew her well enough to be able to call her a patently stupid nickname like “Meesh.” These scenes featuring “Jocelyn” and her group of kids living happily within the walls of Alexandria are all dripping with tension, not because of anything happening on screen but because the audience possesses the knowledge that something unknown is about to go terribly wrong. And indeed it does, of course—Jocelyn reveals herself to be completely insane, kidnapping Alexandrian children to add to her Cronenbergian brood. Michonne and Daryl, naturally, ride out in hot pursuit. It all leads to a confrontation that plays out as equal parts disturbing and grossly comical. In the same way that tension is added to the scenes with Jocelyn in Alexandria, it’s sucked away from the scenes of her torturing Michonne and Daryl. How can it not be, given that the audience already knows that all the characters involved survive, albeit with some rather prominent scars? At the same time, I can process on an intellectual level that the sight of Michonne carving her way through a group of children with a katana is supposed to be gut-churning, but the fact that those children are portrayed as unflinchingly, unrepentantly evil steals some of the situation’s gravitas. They don’t come off as deluded, victimized kids—more as physical punchlines. The weight of that scene was more like a hyper-violent bit of Rick and Morty animation than the soul-crusher that I expect they intended. 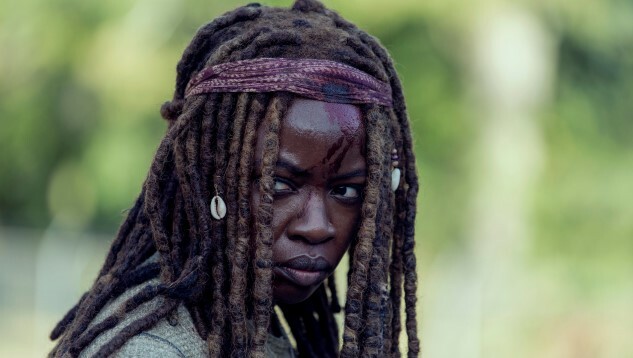 Honestly, the more effective emotional devastator was the far simpler one we get at the episode’s end, as young Judith (quickly emerging as this season’s MVP) lays out in simple terms how Michonne’s fear of loss has led her to turn her back on the people she claims to love. It’s hard not to get a little misty eyed when Judith innocently asks “when we stopped loving” Daryl, Carol, Maggie and “the King.” From the mouths of babes, etc. — I’m sort of confused as to why the character of “RJ” exists on this show at all. He’s appeared on screen so briefly this season that he can hardly be said to properly exist, and he doesn’t ever appear to spend any time with his mother or sister. Is he just here because he’s supposed to be part of the feature film arc in the future that will involve a returning Andrew Lincoln alongside Danai Gurira? They wanted Rick to be able to have a son for these films, or what? — I’m having a hard time buying that even a crazy person would give up the safety and comfort of living behind the walls of Alexandria in order to be in a dank warehouse full of broken glass with their brood of stolen children. I mean really—after Jocelyn had been living in Alexandria for a while, wouldn’t she take a look around and think something like “You know, this is actually pretty nice, maybe we should just stay here”? — I love imprisoned Negan far more than I ever liked Negan as the leader of the Saviors. He has such a relaxed, composed energy in that cell—the kind of surety that comes with not having any power and having nothing to lose, which gives him the freedom to say whatever he wants. He wins every verbal exchange with Michonne easily because she has nothing to threaten him with. He simply radiates calm and cool. Anyway. The final two episodes of The Walking Dead season 9 are titled “The Calm Before” and “The Storm,” making their intent pretty damn obvious. The “next week on TWD” bumper goes a long way toward answering my repeated questions of how a group as incompetent as The Whisperers are ever supposed to pose a threat to Alexandria, The Hilltop or The Kingdom—turns out that if all the main characters wander out into the woods and get captured (as appears to happen), it becomes remarkably easy to put them in jeopardy. Who would have thunk it? Oh well. At the very least, “Scars” gave me a few things I’ve been requesting for a very long time. When it’s The Walking Dead you’re talking about, you take those victories where you can get them.